Two images from the Psalter Aureum (the "Golden Psalter") from St. Gall, dating from the mid- to late-ninth century. It contains what are probably the most famous images of Carolingian armor. Two images from the Trier Apocalypse, circa 800 CE. The second image depicts what might be lamellar armor, and helmets which could either be spangenhelms or the artist's interpretation of Byzantine helmets as depicted in Eastern manuscripts. Below is an image from the Leiden Prudentius, dating from the second quarter of the ninth century, showing what an interesting helmet, almost certainly drawn from a classical illustration. Here are a few ninth century ivories. The first is the front cover of the Psalter of Charles the Bald (circa 842-869 CE). The second and third are psalms 24 and 26 from the Prayerbook of Charles the Bald (circa 860 CE). This last image is an ivory plaque depicting the meeting of Abner and Joab near lake Gabaon (circa 870 CE). I find this rare depiction of Frankish helms (if that is in fact what is being depicted) "in the round" to be especially interesting. Shortly after this date, the helmets depicted in East and West Frankish manuscripts change, and come to resemble more closely the round or pointed helmets known from other sources and from archaeology, as shown in the St. Gall Book of Maccabees. This is a great thread, worthy of a spotlight... Thank you Mr. Miller. The unpleasant looking fellow in the middle appears to be wearing a langsax... at an angle, no less. Yeah, I just noticed that too! Information on langsax scabbards is almost non-existant (compared to broadsax, which there are many dozens of examples), so this is pretty valuable information. If anyone else comes across anything saxy in manuscripts, please post! 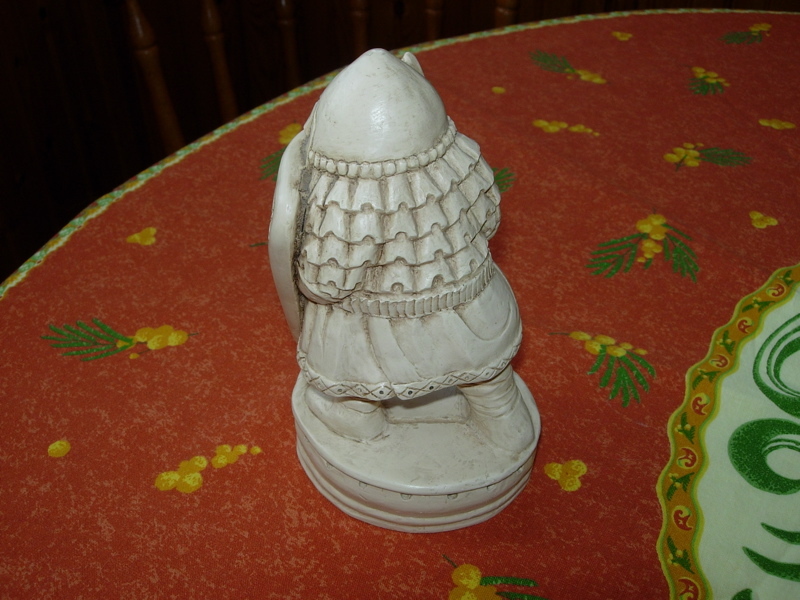 Here are a few pictures of a paperweight I have that is a pretty close copy of a pawn from the famous "Charlemagne" chess set. Although I believe that the set is actually dated to around the 11th century, The armor shown on the figure is worth a look. If I were to hazard a guess, I would say that it is NOT mail, as it appears to overlap like some kind of scale armor. It also only goes to about waist level, but I couldn't say if that is accurate or just the way it was carved, although I think that the short sleeves are probably right at least. My guess is that it represents some kind of leather armor, mainly because mail could be much easier to carve (just a series of circles or some similar pattern) than the curved and fairly intricate 3-D carving shown on the figure. This guy is pretty hefty and stands about 6 inches high, but I've looked at the original much smaller piece it's based on and it's pretty close. There are a few giveaways as to it's later date than the Charlemagne era, however. The kite-shaped shield for one. The Norman-style nasal helm for another, although I see no reason that that sort of helm wouldn't be available during Charlemagne's day, although perhaps not to ordinary soldiers, which is what this guy is supposed to be. He wears a tunic and leggings, which I am pretty sure were standard for Charlemagne's time. The sword appears short, but I don't really think that means much. It was probably just carved to fit within the limitations of the piece. It probably just REPRESENTS a sword rather than a particular KIND of sword. Also, armor types did not move cleanly from one type to another. There was a mixing of old and new all through the centuries, since such items were very valuable and I am certain were only thrown away when useless and worn out, whether they were the latest style or an older design that was still functional. But anything is better than nothing, so that alone makes me think that the armor shown, although depicted on a slightly later era soldier, would perhaps not look out of place a century or more earlier. Ok IM a nobody, but I have some knowledge in this stuff and have been studying the Carolingians for quite some time. All the old arguements are old, and as it is stated everywhere no one really can by fact establish mail versus scale argument, or visa versa that outweighs the other. But as a studied historian and as a artist myself I will give a logical argument based only on logic for facts are lacking here and demands that logic take over the question. Firstly one must study the art for itself to seek out the hints which builds towards evidence. I will only address the first Stuttgart Psalter Scale depictions. As an artist I see a artist who is very capable of making clear lines, showing angles, depicting weapons very accurately. His conventions are simple and strait forward, in all the materials, body parts and angles that he provides. Almost no where else are there strange conventions in shape and form. The only obvious one applied is the angle of the heads of all the horse riders and many infantry. However one can easily explain that the artist wanted us to see these bold riders faces and not waste any of his story on profiled warriors. So that leads me to the scale. The artist again makes clear lines, showing obvious shadows, Some times showing fluting on the scale themselves. Why when the artist is so clear in his other art could he not simply reproduce some thing that looks much more like chainmail. The answer is that this artist could have. He was not lazy in the rest of his art so that should not be the explanation either. Infact there are only two reasons for convention in art. Lazyness on behalf of the artist or creativity showing abstracts. This is not the case in the Stuttgart either. The Armour worn is also often varied so leads us away from an artist who is unsure of his work or is simply conjecturing the material. If it were merely a convention of mail or some other armour that the artist did not simply see himself. Then it would seem likely the armour would be much more uniform. The artist was representing something he had first hand knowledge of. The artist was capable of reproducing everything he saw in realistic and clear terms. The artist drew an armour that was semicircular and with a oval ends on trim and hems. The armour depicted clearly has dimensions, angles, and characteristics that chainmail does not have. I am simply incapable of believing that the artist here was depicting chainmail. I know the arguments go both ways by many renown scientist. So here I bring another angle to the argument. Logic and Art. I believe it tips the scales resolutely in favor of Scale hauberks. From the tresaure of Nagyszentmiklós, Transylvania. Late avar period (670-810 cc.). There are a couple of artifacts of late Merovingian era that look like fragments of lamellar armour plates, and one skirt that is undoubtedly banded strips of iron in some form of lamellar armour. Bordering regions where burial with armour continued longer (Sutton Hoo, Saxon-Sweden, etc.) seem to have mail mixed with coins and and other works judged to be of Merovingian/ Carolingian origin though. Also, from "The Knight and the Blast Furnace", some objects like the Coopergate helm appear to have recycled bits of Roman era segmentata plates found together with mail aventail fragments. Recycling and a mixture of armour types seems better supported by period artifacts found together with late Merovingian/ Carolingian objects in neighboring territories. Auguste Demmin, "Illustrated History of the Arms and Armour from Earliest Ages"
The above illustration is from a dodgy reconstruction. The fragments are not from a cuirass at all. I can't remember whether they were actually from a forearm or shin guard. I admit it is hard to find much that is "significant" in terms of evidence of Migration Era armour, but quite a few fragments do not receive much publicity since they are just fragments. This site was judged to have many significant (Merovingian jewelry, multiple weapons, shield bosses) warrior graves. The fact that no armour was found, suggests that metallic torso armour may not have very common in this region during Migration Era. How expensive was the jewellery that was found? Was armor more valuable than gold and gems? The relative worth, 1500 years ago, of a variety of rare objects considered rare in that day is too tough a subject for me to argue. That said, the information available so far about the site characterizes these as graves of a fairly elite class. As the artifacts are presently undergoing restoration, thorough details are not really published yet. There are some other articles on the Canterbury archeological center's web site, and a few abstracts summarizing the grave finds. I believe up to 14 different sword remains were found which is uncommonly high for the number of male warrior graves. (About 40 judged to be male warriors. Spearheads and shields were also in some of the women and childrens' graves such that about 40% of the population buried had some form of weapons and shields.) One unknown object is being considered as a possible pommel due to its proximity to remains of a blade. It is a pretty circular shaped metallic object, which would be pretty unusual stylistically if it really was a pommel of that form in 6th century period. Some of the broaches are of the Merovingian type comprised of gold and differing types/colors of garnet, similar to the Sutton Hoo sword hilt, but not as well preserved. Other objects included two intact glass drinking horns, etc. Origins of valuable objects have been described as both Frankish and Jutland. I am embarrassed to admit that I only recently heard of the linothorax. Its existence seems irrefutable based on writings, but what is was comprised of is debated (leather, linen, composite, etc.) as none seem to have survived. The term continued to be used in Byzantine-Roman writing into the early Migration era. It is at least "feasible" that the art in question for this post depicted a textile type garment and pteruges. Even if anachronistic, it could have been a stylized manner of depicting classical armour form. In all the pictures I've seen horses do not have the stirrups. Strange for the period. Only two images from the Psalter Aureum (the "Golden Psalter") from St. Gall, dating from the mid- to late-ninth century. In all the pictures I've seen horses do not have the stirrups. A couple of the ones posted by C.L. Miller seem to have details around the feet that could be interpreted as stirrups. A lot of the illustrations are fairly simple, not even depicting tack on the horses. But we are pretty certain that they did use saddles regardless of what the illustrations do or don't show. Surely there were stirrups in the period, I agree with you. I was referring to this photo, apparently with good detail. The two archers, mounted his horses, from behind. 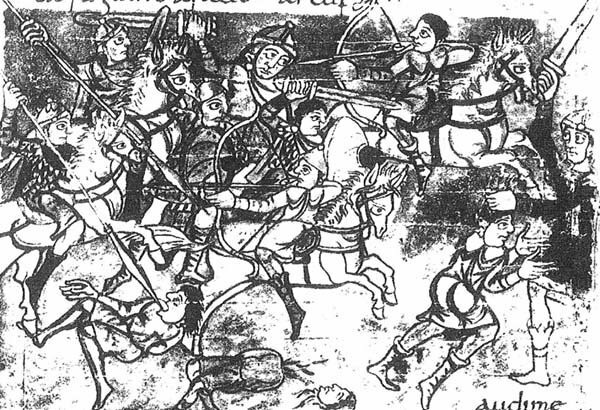 I think that's just (somewhat confused) period artist interpretation of cavalry shooting their bows backwards on enemy. As you probably know during the 9-10th centuries the nomadic Magyars swept through Europe. Maybe the late Carolingian artist meant to depict Magyars ,but didn't quite know how (and horse-archery was alien to him). It seems that the Stuttgarter Psalter miniatures were copied from other miniatures of the previous era dating between the 400 and 600 A.D. I believe that those depicted are archers of the Roman army of the East. The Byzantine archers already in the VI century pulled if pursued, the manner of the Parthian, in other words, rode backwards. In the sixth century, the curved composite bow was the main weapon of the Byzantines. They were copied by Huns. In Europe, I believe not used by anyone, unless it was Byzantine. the Goths and Lombards knew the composite bow but could not build. The lack of Stirrups is right for the period, the headgear of the archer is a Pilleus already in use in the third century. Some books seem to corroborate the thesis that these miniatures covering at least the sixth century. This, if i translate as well.